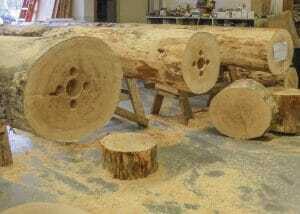 Hi, I was wondering about the dimension of extremely large timber members. Are there very large dimensions for lumber (like 2′ x 3′ or more). We can get very large timbers in Douglas Fir which is prone to very large checks, or in glue-laminated material. The checks are natural, and make the timber look old.